“Hygge”, is, to put it simply, the Danish art of being cozy, and it has traveled overseas and become an American obsession. And with good reason. Most people wouldn’t object to a little extra coziness in the home. When the weather starts to get chillier we layer up with cozy knits, so why not do the same with our décor? We’re giving you all of our best design tips to add warmth to your décor and create a cozy living room fit for the weather. Adding warmth to your home décor is best started the same way you add warmth to your clothing, with layering. The easiest way to start is from the ground up. In this case, a rug. Specifically a rug with a higher pile, like a chenille, sheepskin, or shag rug. Moving upwards, add pelts, faux fur, or knit throws to your sofa. Faux fur is the ultimate in coziness. If it’s not your style, you can also add in textured, furry, or fuzzy throw pillows to add warmth and texture to your seating. Mixing and varying texture in your space will add depth to the room and in turn, warmth. Linda Maguire, our manager in the Boston showroom, explains, “It’s really about coordinating rather than matching.” Just keep in mind that if everything in your room is textured, you’ll lose the contrast and interest. Consider all the ways you can replace clean, smooth surfaces with something textured. An easy pick? Choose a furry upholstered ottoman over a wood coffee table. Window treatments create a cozy environment. If you only have blinds, consider adding floor-to-ceiling drapes. They can be sheer or full, it’s the volume that will add warmth. Color is extremely important to consider when you want to warm up a room, especially if it doesn’t get a lot of natural light. Colors on the warm end of the spectrum, from pale gold to rich brick, are great options for wall color. If your wall color is white or cool-toned, add in pops of warm color with your accent pieces or blankets. Finally, don’t be afraid to mix warm and cool tones. You can’t read a book about hygge without a mention of lighting. Ambient lighting is perhaps the number one element to consider when it comes to prepping your space for cold weather. You can add in all the faux furs you want, but if your lighting is cool-toned and singular, your space will read cold and austere. You want to have multiple sources of ambient lighting at every level of the room, and avoid relying on your overhead lighting. A combination of lamps, sconces, fairy lights, and lit candles will instantly add warmth. When purchasing lighting, opt for warm glow bulbs as opposed to bright, harsh lighting. 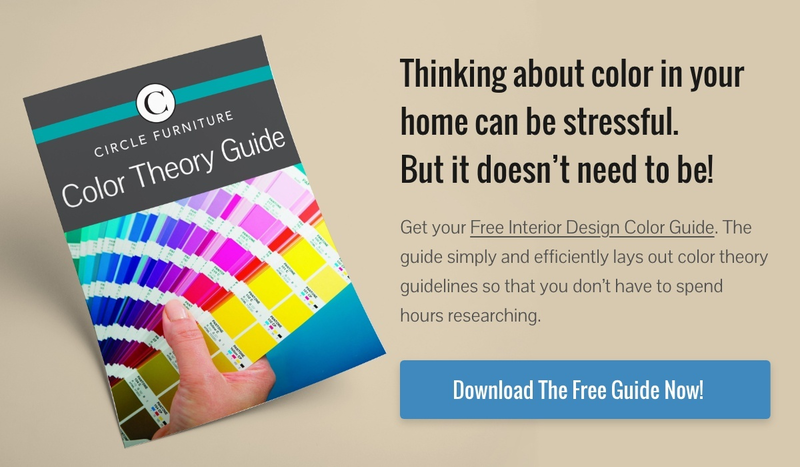 When choosing upholstered chairs, think about depth. A cozy chair is one you can sink into, like the Addie. If you have space for it, a sectional with a chaise lounge, like the Putnam, is perfect for curling up and reading. You can add down to your pieces for added comfort and warmth, although it does require some maintenance. Sofas or upholstered chairs in a fabric are generally cozier than leather. Floating your furniture integrates and delineates the space, creating a cozy environment. There are a lot of reasons to add warmth to your home. Consider it this way: when you come in from the cold and take off all of your layers, you want a space that nuzzles you, embraces you and makes you feel cozy and relaxed. The best part is that it’s not complicated. With simple additions of faux fur throws, fuzzy textures, candles, warm glow lighting, and warm pops of color, you can quickly make your home inviting. A designer can help you coordinate your space and add warmth where it needs to be added. Come into a Circle Furniture showroom and chat with a design consultant about adding “hygge” to your home.